Ashley Norman spent the year in Taiwan. She is a graduate of DMHS and has returned home. On Monday, August 7, 2017 she will gave her report to the club on her year in Taiwan. She is attending the University of Mississippi as a junior. 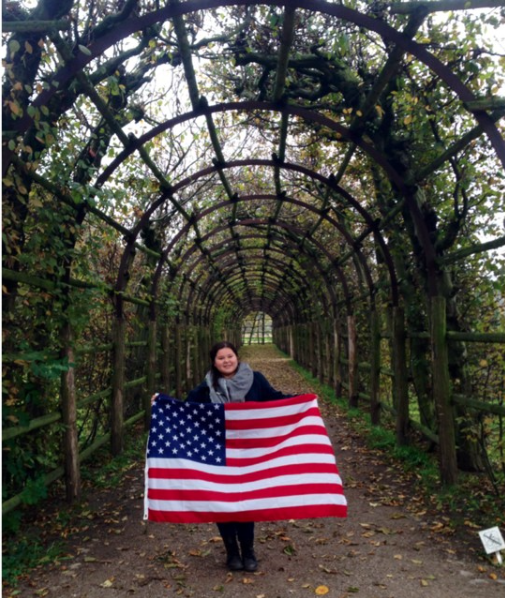 Alexandra DeWeese spent the year in Netherlands. She returned home and immediately became a summer intern in the Boston area. She is in her senior year of high school in Cambridge, Mass. She gave her report to the club on November 6, 2017 part of which was in Dutch. Pei-Lin (Peggy) Chuang was our inbound student for the year. She came to us from Kaohsiung City, Taiwan. While here she attended Saguaro High School. We enjoyed her attendance at our Monday club meeting nearly every month. She had three host families: Ashley's parents, Rotarian Sarah, and Rotarian Gail. Gijs ten Hoven came to us from a tourist island in Netherlands. Turns out is a good friend of Julius (inbound 2015-2016). Julius was a great help in orienting him upon his arrival in August 2016. He attended Chaparral High School.. Rob and Ann Whyte hosted Gijs. • Julius Obdeijn was our Inbound Rotary Youth Exchange Student from Maastricht in The Netherlands. He attended Chaparral High School during his Exchange and was a great RYE Ambassador. Kevin Bollinger did a fantastic job as his Club Counselor. • Leah Randolff was our Inbound Rotary Youth Exchange Student from Verl, Germany. She attended Arcadia High School during her Exchange and was a super RYE Ambassador. 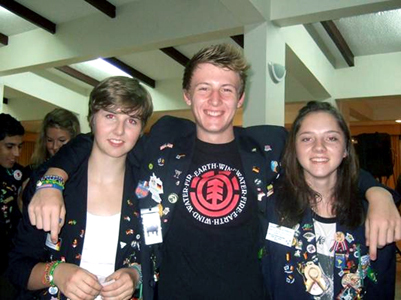 • Cooper Newnam was one of our Outbound Rotary Youth Exchange Students. He spent an amazing year in The Netherlands after graduating from Chaparral High School. In 2018 he reports he is a Sophomore at ASU in their Industrial Design Program. He continues to have a passion for languages and cultures, and hopes these passions will be useful in industrial design. • Annie Kufel was one of our Outbound Rotary Youth Exchange Student. She spent an incredible year in Liège, Belgium. • Valentina Cristi was our Inbound Rotary Youth Exchange Student from Coyhaique, Chile. She attended Coronado High School during her Exchange and was a wonderful RYE Ambassador. In January 2018 she returned to Scottsdale to visit her host families and friends. She is in her third year of studies at Mayor University in Santiago, Chile, majoring in Agriculture. She is interested in travel and eco-tourism. • Lili Donnenwirth was our Outbound Rotary Youth Exchange Student. She spent an amazing year in Lübeck, Germany. She is attended American University in Washington DC for two years, but has returned to Arizona to finish her college studies. 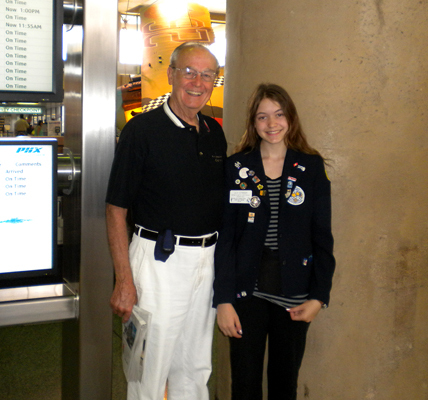 • Mathilde Haahr was the Rotary Club of Scottsdale’s inbound exchange student during 2013-2014. She is from Denmark and attended Chaparral High School while she was here. She had a wonderful time. Her Rotary Counselor was Wendy Wentz. • Essi Pelttari from Finland was our other inbound exchange student in 2013-2014. She attended Desert Mountain High School. Our inbound students usually have three host families during their year here, spending 3 to 4 months with each family. Essi’s first host family was the parents of our outbound student to Finland. Her counselor was Rotarian Adriana Gruber. • Lynn Mishark was our outbound student to Finland during 2013-2014. She is from Desert Mountain High School and had a wonderful time in Finland. 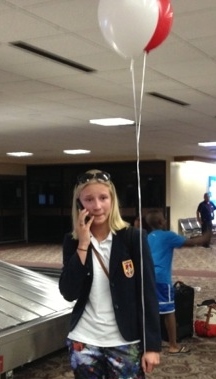 Upon her return from Finland, she has enrolled in AAEC Early College High School. • Ally Wolf was our other outbound student in 2013-2014. She came to us from Chaparral High School and had a great time in Denmark. She is attending a university in the Pacific Northwest. • Scottsdale Rotary teamed with another local Rotary Club to sponsor an exchange that involved Wyatt Miller of Chaparral going to the Milan area of Italy in 2013-2014. • In 2012-2013 Tasina Thorne from Coronado High School went to Denmark as our outbound exchange student. Being a Native American, she was asked to speak to several Rotary clubs in Denmark about Native Americans. 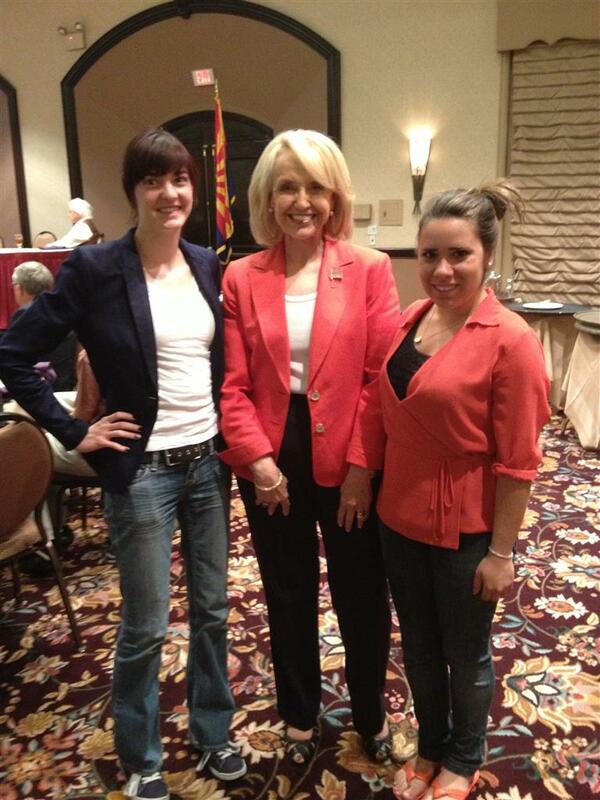 She was an outstanding youth ambassador for Scottsdale. • Emily Halber was also an outbound student of Scottsdale Rotary in 2012-2013. She spent her junior year in Brazil. She returned to graduate from Desert Mountain High School in 2014. She found that by spending a high school year abroad, she could learn how to more easily adapt to different situations. She is now studying International Affairs at Northern Arizona University. 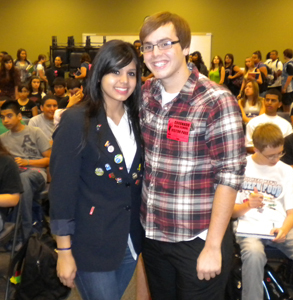 • Isabella (Isa) Danadae from Brazil spent her Rotary year with us attending Desert Mountain High School. One of her host families was the Mishark family where she no doubt had significant influence on her host sister Lynn going on RYE in 2013. • In 2011-2012, Lily Strider of Chaparral High school went to Paraguay. She too returned to graduate from high school and spoke to several high schools about her experience, being a great youth ambassador for Rotary Youth Exchange. She is a senior at Northern Arizona University with a double major of international relations and Spanish. She spent her sophomore year at NAU studying abroad. She will spend the first half of the senior year in Seville, Spain where all her classes will be in Spanish. She is proud that since RYE she has already become acquainted with the cultures and has friends in 23 countries. • Sarah Hagerman spent the 2010-2011 year in Ecuador. She returned for her senior year at Coronado High School where she had decided to study German. In college she became active in Rotaract. Exchange Students in Ecuador: Sarah Hagerman is on the right. • Andy Ward was the senior class president at Coronado High School prior to going to Argentina for the 2010-2011. He had a wonderful time in Argentina, getting to travel to the most southern tip of South America. He has returned and plans to attend college in South Carolina. .Natha Giménez was also here for the year 2010-2011. 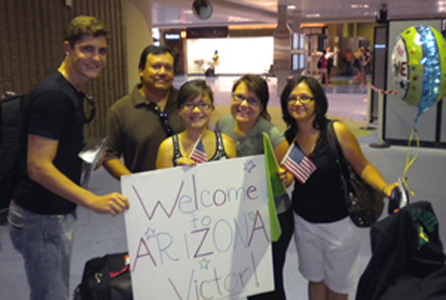 Natha was our first ever inbound student from Paraguay and attended Coronado High School. Her first host family was the Horrigan family: one host sister, Jessica, participated in many Scottsdale Sister Cities youth activities. Natha’s second host family was Max and Annette Rumbaugh. Natha was active in sports while here: a volleyball team manager, a first string of the girls basketball team and on the track and field team, where she won a letter. • Victor Fachin was here from Brazil for the 2010-2011 school year. He attended Saguaro High School and lived with the Torres family. Alina Torres, Victor’s host sister was in Sweden during 2009-2010 year. Victor arrived speaking Portuguese, and left doing very well in both Spanish and English. • Kendall O'Roark from Desert Mountain High School did her exchange in Milan, Italy during 2010-2011. She was able to attend a fashion design high school there. Upon her return, she graduated form high school, did a fashion internship in Istanbul, Turkey and then got a scholarship to Parsons the New School for Design in NYC. She is now stationed out of San Diego, but travels the world as a fashion model. • Alina Torres returned to school at Saguaro for her senior year. She had a wonderful year in Sweden. • Jennifer Kempton is enrolled at Arizona State University after returning from Braunschweig, Germany. She is the first Rotary exchange student from Coronado High School to complete a year overseas. • Peter Li was our first student from the orient. He came from the city of Miaoli in Taiwan during 2009-2010. While here he made many friends and had a wonderful sense of humor. His first family had only boys, so he learned early in his exchange year how to enjoy “horse playing” with his friends. He attended Coronado High School. • Maria (MaFer) Giler came to Scottsdale for the 2009-2010 school year from Portoviejo, Ecuador. She is the kind of person that everyone likes. So she made many friends and her parting was particularly sad for all who know her. 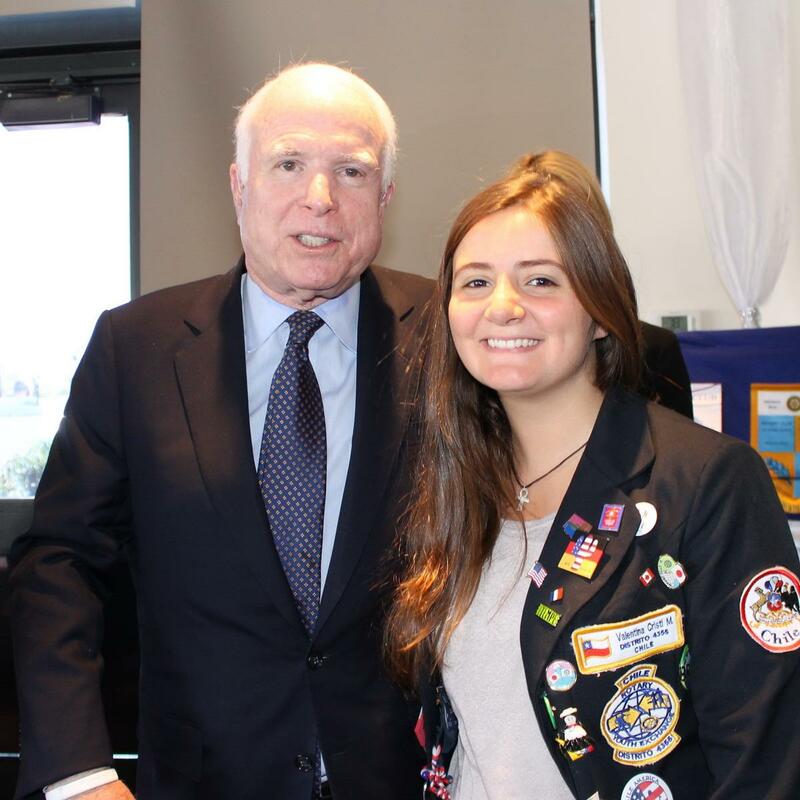 She participated in the graduation exercises at Saguaro High School in May and returned to her home in Ecuador in June after a wonderful year in Scottsdale. In 2012 she entered a Monastery of the Poor Clares sisters in Azogues. Azogues is nine hours form her hometown of Portoviejo. In 2017 she reports she has three more years of formation to profess perpetual vows. • Laura Sanchez came to Scottsdale from Granada, Spain, which is a city with about the same population as Scottsdale. She was sponsored by the Rotary Club of Granada. A dedicated tennis player, she had played for 5 years under the tutelage of a coach and had successfully competed in Granada and Spanish competitions for the 3 years prior to coming in 2008. While playing for Saguaro High School she was great addition to their team. Her interest was in Journalism and Mike Ryan provided her an opportunity to write an article for the Scottsdale Republic. In the summer of 2011 she returned to Scottsdale and gave a short report to the Rotary Club. She expects to graduate from high school in Spain in 2012. • Maxime Goffinet came in 2008 from the French speaking part of Belgium, near Liege. His primary objective was to perfect his English, though he has had eight years of English. He enjoys sports (rugby, soccer and skiing) and music. He played rugby while here. He has already traveled to Spain, Greece, Turkey, Egypt, Tanzania and had a short exchange experience in Northern Ireland. He attended Desert Mountain High School. He plans to visit Scottsdale in September 2011 and to attend Rotary while here. Duncan Shuckerow, after spending a year in the Netherlands, graduated from Columbia College in Chicago in 2014 and is working for the Miami Homeless Colition through AmeriCorps/VISTA. • Riana Del Vecchio went to school and lived in Sardinia, Italy for the 2007-2008 school year. Her family has its roots in Italy and the exchange gave her the opportunity to learn Italian. She also enjoyed living and studying while learning the culture of her Italian grandparents. She says she actually learned to enjoy shopping and coffee there. Riana returned to Scottsdale to finish her senior year at Desert Mountain High School. • Janelle Brown was the other of our club's 2007-2008 outbound exchange students who spent the year in Belgrano, Dolores, Argentina. She went the year following her graduation from Saguaro High School. To summarize her year, she says she loved the experience and learned so much. She now has a second family, her host family in Argentina. She says, “Thank you for this opportunity.” The summer after her return, she worked at the Sugar Bowl for Carroll Huntress. She is attending BYU and went on a missionary trip to Washington DC where she used her Spanish skills. •Herbert Ellerbusch came to Scottsdale for the 2007-2008 school year from Blielefeld in Northern Germany. He attended Coronado High School. During the year he enjoyed attending the Diamondbacks game with Rotarians, hiking up Camelback Mountain with John Wintersteen, and going to RYLA camp. He enjoyed Arizona, but wanted to be sure and visit the East Coast of the US. He had that opportunity, participating in the Rotary organized East Coast trip between the end of school and his return to Germany in early 2008. Aaron and Isley Kern were his third host family. • Matthias Matenaer attended Saguaro High School during 2006-2007. He came to us from Germany. One of his highlights of the year was skiing with John Auran in Colorado. 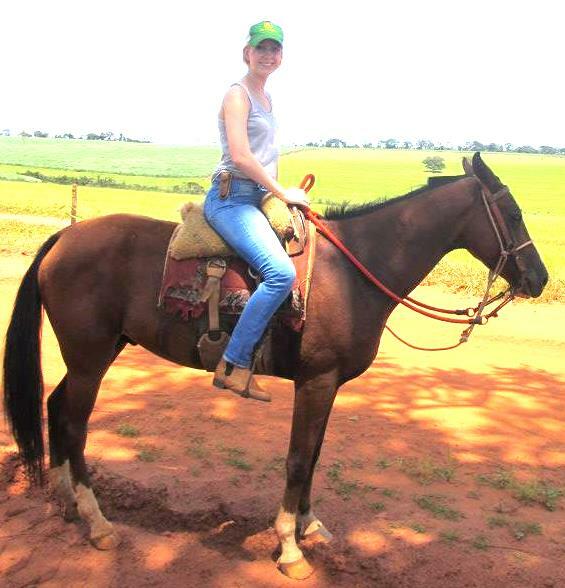 • Carol Lima de Mello was our 2006-2007 inbound exchange student from Brasil. She attended Saguaro High School while in Scottsdale. Carol found her hike up Camelback Mountain with John Wintersteen to be challenging. She began to study medicine upon her return to Brazil. • Samantha Quenneville was one of two 2006-2007 outbound exchange students sponsored by Scottsdale Rotary. She went to Peru. • Katy Roe returned to Scottsdale the summer of 2007 from a year in Denmark. She spent her junior year there and returned to finish her studies as a senior at Desert Mountain High School. • Spencer Russell spent the 2005-2006 school year in Ecuador. He went there the year after graduating from Saguaro High School. He found it interesting that they use the US dollar in Ecuador. He returned to begin his studies at Arizona State University. Parker Young was the first student in 25 years to be sent to Sweden by District (5510). Upon his return he attended and graduated from ASU. In 2016 he was working for Four Seasons traveling and working internationally. He joined the Beverly Hills Rotary Club. In 2018 he moved back to Scottsdale and works for Yelp. He attended the Scottsdale Rotary Club in April. • Antonio Conato was our inbound exchange student from Naples, Italy in 2004-2005. He attended Horizon High School. One of his host families was Mark Walker and his wife Ligia. He reports that he still misses Scottsdale and thanks the people here who made his life so wonderfully different than it would have been otherwise. He says, “He left a piece of his heart in Scottsdale.” He has finished degree in Economics and will soon take exams to be an accountant. In the meantime he works at his father's start up company company, Dieciprima, a maker of high quality pasta tomatoes and Italian specialties. He would like to visit Scottsdale sometime. • Dessa Shuckerow spent school year 2004-2005 in Denmark. She went the year after graduating from Saguaro High School. The Danish language is a difficult one, but her host family’s young children were a tremendous help in her learning to speak it. She returned to attend Boston University, where she felt she was accepted to a large extent because of her youth exchange experience. After college she did social work in Chile. Dessa is currently (2014) in Cambodia on a 2-year Mickey Leland Fellowship, working for the UN's World Food Program. • Patrick Roe went to Belgium for his exchange year in 2003-2004. This was during his junior year. He particularly enjoyed the opportunities his Belgium Rotary hosts gave him to visit many cultural sites in Europe. In Scottsdale, he attended Desert Mountain High School, where he returned for his senior year and graduation. He and his sister, Katy who went overseas in 2006, were the first brother and sister to be Scottsdale Rotary Exchange Students. Yoshi Budiyanto went to Milan, Italy for his exchange. He was hosted by the Rotary Club Monza Ovest. He recently visited Scottsdale Rotary and reported that he had recently visited his host club. He brought a banner from that club and exchanged it with our club. He earned his B.S of Finance (2006) and M.S. in Sustainability (2014) from ASU. He has been working in IT consulting and started a small business. He is currently pursuing a Ph.D in Sustainability focusing on water issues in the west by incorporating behavioral economics, mathematical modeling and adoption of technology.